I’m quoting here. I wish I had thought of this before I read it. It is important in everyone’s life, and especially when evaluating. It’s that last part to which evaluators need to pay special attention; the “disclose results in a transparent manner” part. There is no one looking over your shoulder to make sure you do “the right thing”; that you read the appropriate document; that you report the findings you found not what you know the client wants to hear. If you maintain accountability, you are successful; you will win. 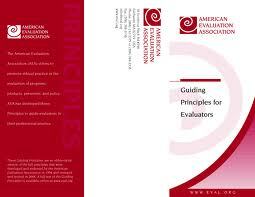 AEA has a adopted a set of Guiding Principles for the organization and its members. The principles are 1) Systematic inquiry; 2) Competence; 3) Integrity/Honesty; 4) Respect for people; and 5) Responsibilities for the General and Public Welfare. I can see where accountability lies within each principle. Can you?